May 29th, 2009 admin	Enter your password to view comments. Em’s spring program went well. She played the recorder and sang, and I have some pics which I think came out well but I haven’t uploaded them yet. Unfortunately, the program started at 7 and by about 7:30 at night, my daughter is usually pretty tired and ready to start winding down for the night. She yawned her way through the program. There was a local belly-dancing group who performed first – really! Then there were some technical difficulties with music playback which slowed things, and the program was a little long for her. She had a good time, but after a disappointment (she wanted to pick up a book after the program but the room selling books was closed) she was in tears before we left the building. She was just overtired. We got home and I got her a snack while she unwound a bit. She was already fading, asking “why do people have to sleeeeep?” and other similar questions. She got to bed at around 8:45 but any little thing that went wrong would send her back into tears. She cried in bed for over an hour. I kid you not. Lest anyone think I am hard-hearted, going in to help was counter-productive, as she didn’t want me to help, no matter how phlegmy she got. What she really needed was sleep and me helping just woke her up more. She was just too tired to sleep. Her statement, “I don’t like anything!” really summed up the situation. Well, we’ll see what we can do. Right now she’s asleep again so I’m going to try to sleep too. Her being awake and crying makes me tense and frustrated, so it’s best to catch a few Z’s while I can. Today on my way to pick up my daughter from school, I spotted the Google Earth car turning onto my street. I assume they were recording a side street. I know our street has already been done, since I’ve seen my house on Google Earth. Therefore I didn’t feel I had to frantically mow the lawn or, more likely, stand out front making the Vulcan salute or something equally goofy. However, it begs the question. If you knew the Google Earth car was coming to photograph your house, what would you do? 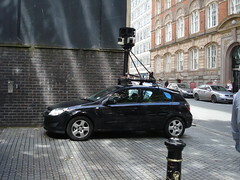 Interesting sights caught by Google street view. UK village thwarts Google street view. Mad scientists captured on Google street view. D&D Week 23 part 2: Don’t go into the water. Poor tortured Val finally stops running away from us. We divvy up treasure and continue on into the formerly flooded passage. GM Vaschon: Your party travels down the sloping passage and sees a long corridor to the east. Water appears to be mostly drained with roughly 2′ remaining. Palin: You’re right, these quotes are dooming us. We cautiously make our way into the water. D&D Week 23 part 1: Val lends a hand. This week’s update will be broken into two parts. The first involves me catching on fire – of course – but mainly, it’s all about Val. I have never ever seen someone have such a run of bad luck as Val did this week. It was just one thing after another, and most of those things were inflicted by his own party. Poor Em. She really wanted to go to school this morning in spite of being exhausted from another night of waking up at 2am and not getting back to sleep. I let her go, but with a note to her teacher. The teacher called at around 9:30 and Em’s back home again. She went right to her bedroom and lay down under the covers still in her school uniform. She wasn’t able to get to sleep, and now she’s on the couch watching TV quietly. At this point I’m not sure what’s going on. We’ve changed pillows, gotten an air purifier (although the pollen was very low yesterday), and made as many adjustments as we could without disrupting the regular nighttime rituals. Right now I’m looking at diet as a possible culprit. She’s a little lactose intolerant, and she had ice cream late in the day on Saturday and Sunday. She didn’t show any gastric distress at all but it could still be affecting her. But then, the last time we had a run like this it was a Mon-Wed, so maybe that’s not it after all. Her father and his father both have bouts of insomnia, so maybe it just runs in the family. I don’t know. I just know she’s miserable. Hopefully tonight will be better. The little visitor was back last night. It feasted on a piece of toast leftover from yesterday’s breakfast. You may notice that the toast is wet. 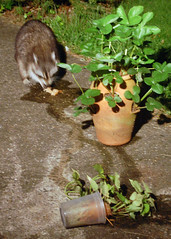 That’s because the raccoon upended the “sweet potato in water” experiment to moisten its food. Clever! 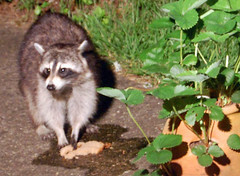 I refilled the sweet potato and the raccoon came back about 15 minutes later to drag the second piece of toast we made out of the trash. As my husband points out, this is all very cute now, but at some point it will strew all the trash across the lawn and then it won’t be so cute. Em had trouble sleeping again last night. She maintains that her pillows aren’t comfortable. I’m wondering if the bedframe cutting into the pillows, or if it’s maybe the mattress. She was also sniffling some yesterday evening, but the pollen count was low, so I think maybe she’s got a little bit of a cold. Today, Em is lying on the couch and watching Disney Channel reruns that my dad recorded for us years ago. Clearly her energy level is not where it should be, although she does seem to be rallying a bit. My energy level isn’t that great either, what with staying up late and then Em being up intermittently from 3am-4am. Well at least this happened on a weekend. Let’s keep our fingers crossed for tonight. It’s EOG time for the local schools, the end-of-grade testing that determines so many things. They really stress it. Emphasis on stress. I was talking with the moms of Em’s Girl Scout troop yesterday, and one said that she was so freaked out about it that morning that she was crying. It’s a lot of pressure. All of which led to this e-mail exchange. D&D Week 22: Run away! Run away! I was roundly chastised by the group last night for letting updates fall behind, so here we go with last week’s monster-filled session! Props to the GM for finding such excellent illustrations to enhance our experience.